Pinakbet is one of the yummiest veggie dishes from the Ilocano region of the Philippines. 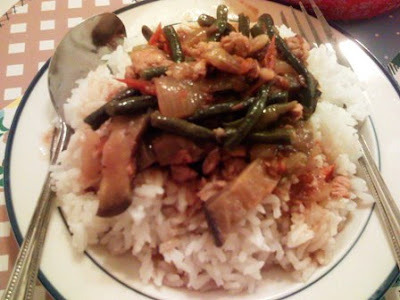 It's a simple mix of pork and vegetables jazzed up a couple of notches higher by fish sauce (bagoong). And man, when I say notched up, I mean notched up! 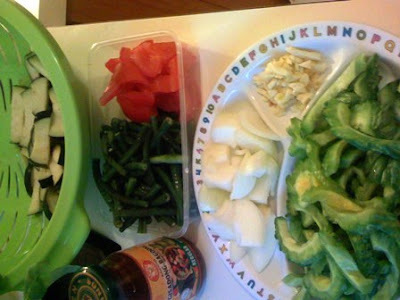 You can smell Pinakbet cooking in the kitchen from all over the house and your tummy begins to grumble. So what's with the freestyle? 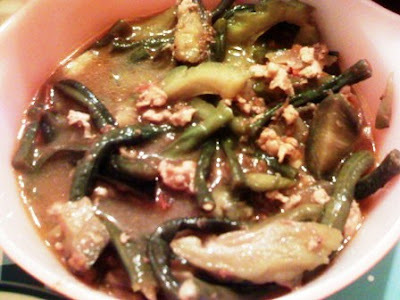 Well, this version makes pinakbet a bit more soupy and instead of pork bits, we use minced beef. 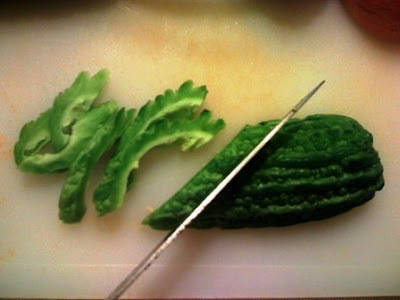 Chop, chop, chop away.... and then we start cooking! Cook the minced beef over water. The water would be around halfway in depth (or lower) compared to the beef. Do not put in too much water or you'll end up waiting for a long time for the water to dry up. When the water does dry up, the beef will release its own oil. Stir-fry the beef, adding oil if needed. Set aside. Heat up frying pan over medium heat. Saute garlic and onion. Add the tomatoes and mix for a couple of minutes. Add the cooked minced beef. Time to open your windows! When you add the veggies, avoid mixing it up because these will get mashed. After a couple of minutes, add the sitaw. 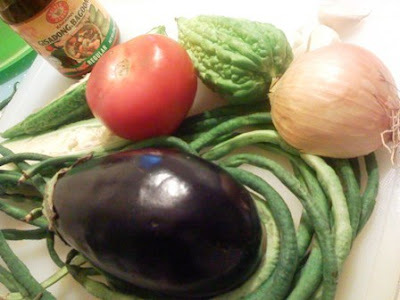 After couple of minutes, add the eggplant. After a couple of minutes, add the bitter gourd. Mix only very slightly, then add water. In this case, we add more water than needed to have more of that yummy soup to pour over rice later. Season with pepper to taste. Cover to simmer, until the veggies are cooked. I occasionally bite into a piece of bitter gourd to test. Serve with hot, steaming rice. Mangan tila! My verdict? I like it better with pork :-). Toni: yes, kakaiba ang eggplants dito... unfortunately mas masarap yung eggplant variety natin kasi pwedeng i-torta. The ones here are a bit tough. That is a freestyle waiting to happen! Try it!